Dear Lush comms team, I get it, I really do. Where the Daily Mail criticises, I empathise. Where industry pundits claim your campaign has nothing to do with your brand, I see the opposite. But the problems you are experiencing with #SpyCops are, regrettably, of your own making. Your campaign – supposed to reinforce your position as a champion of the activist – instead broadly villainises a social and cultural icon. The campaign required more precision. Instead, it felt like you were trying to perform neurosurgery with those tiny knives and forks they give you in airports. The fact is, your campaign fits perfectly with your brand ideals – but as an in-house team, you’ve delivered it with the expectation everyone else is in the same (beautifully and naturally scented) bubble. It came as no surprise that there weren’t any external agencies involved here. Not because agencies are more intelligent or even more creative than in-house teams, but because they bring with them the essential ingredient of contextual perception. 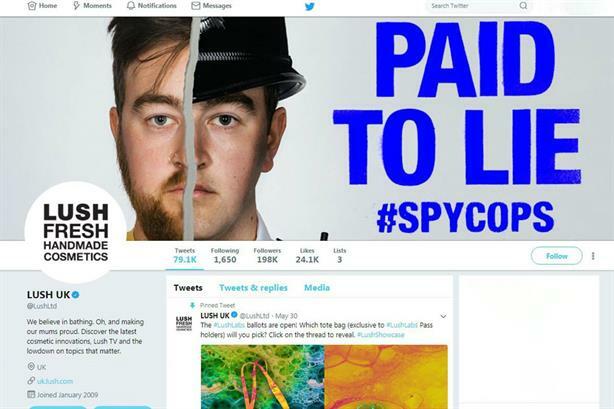 If an agency had been involved, the campaign may well have re-centred your concept around the protection of activists, rather than so bluntly attacking the police. Instead of asking your audience to criticise the police, the campaign should have asked of customers: do you believe in everyone’s right to be an activist without being exposed to deceptive or underhand tactics? The fundamental flaw in your campaign is not taking things too far, but taking them in the wrong direction. For those who don’t believe Lush is well placed to be involved in the debate, they should be directed to your Activist Hub, which impressively takes centre stage on your website. Point them to your activist events. The 361 articles on your blog devoted to activism. If anyone questions the connection to your products, it’s clear that everything Lush does or produces is a form of activism – born from your ‘fight to preserve the planet’. You are better placed than any high-street brand to bring this issue to light, but without the core principle of protecting activists being front and centre, it was destined to become a tabloid dartboard and appear to 'non-Lushites' as a pretty dramatic tangent from cosmetics. Activism is about movements. And movements are about a journey, from a current situation to a new one. Ask any successful rebel with a cause, and what they’ve done is not articulate better than anyone else the problems we face, but the solutions to those problems. It was ‘I have a dream’, not ‘I have an axe to grind’. But, dear Lush folks, at least you are not Mastercard. The problems with their ‘purpose-driven’ campaign to feed the poor if (and only if) Neymar and Messi score in the World Cup don’t come from bad execution. Their campaign wasn’t about saying the right thing in the wrong way, but instead looking for the commercial opportunity in feeding the poor. Unlike them, you at least know that brand purpose is about authenticity, passion and belief. And for that we should applaud you. World Cup sponsors face tricky road to Russia - but can brands really justify being involved?